Eltronicschool. 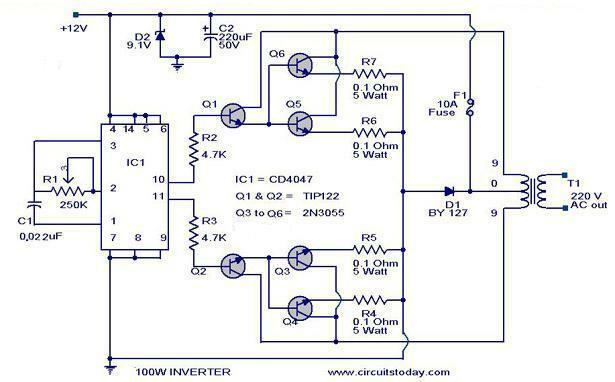 - One the inverter circuit schematic that will help you to create inverter with the capacity 100 Watt Based on CD4047 IC and 2N3055 Transistor. In this time, with based on CD4047 IC and 2N3055 Transistor, we will give you one of electronic circuit schematic of 100 Watt Inverter Based on CD4047 IC and 2N3055 Transistor like in Figure 1. below. Circuit schematic like in Figure 1 above is 100 Watt Inverter Based on CD4047 IC and 2N3055 Transistor. Accordingly Circuitstoday that published this circuit describe that this is a 100 Watt inverter circuit using minimum number of components.I think it is quite difficult to make a decent one like this with further less components.Here we use CD 4047 IC from Texas Instruments for generating the 100 Hz pulses and four 2N3055 transistors for driving the load. The IC1 CD4047 wired as an astable multivibrator produces two 180 degree out of phase 100 Hz pulse trains.These pulse trains are preamplifed by the two TIP122 transistors.The outputs of the TIP 122 transistors are amplified by four 2N 3055 transistors (two transistors for each half cycle) to drive the inverter transformer.The 220V AC will be available at the secondary of the transformer.Nothing complex just the elementary inverter principle and the circuit works great for small loads like a few bulbs or fans.If you need just a low cost inverter in the region of 100 W,then this is the best. For more article, please click here.